With the new harmon.ie 6.8 release, finding content in SharePoint has never been easier. This blog outlines what’s new and how the latest updates will help you find relevant content quicker than ever. It won’t be news to many: there’s a problem with search at most organizations. A report from Accenture found that most managers miss important information every day because they simply cannot find it. A 2018 report into the most broken processes at organizations highlighted search as a particular frustration for knowledge workers, with 49% of respondents highlighting they had significant problems when finding documents. 35% of respondents find switching between apps while searching for information has a negative effect on productivity. 67% said they would be more productive if they could find everything they needed in a single window. At harmon.ie we believe there is a better way. We bring the functionality of SharePoint, including SharePoint search, into Outlook so users can find everything they need in one window. The latest updates to harmon.ie take this one step further. Users can now save personal SharePoint views from within the harmon.ie sidebar, granting you immediate access to the views you use the most. By saving Views, they will be stored as ‘personal views’ that you can quickly access to organize content in ways that make the most sense to you. Greater capabilities for customization and personalization make it easier for users to find the information they need, when they need it. By quickly narrowing SharePoint lists through these column filters, users can find what they need faster. For instance, with the date modified column you can use a slider to select between predefined options, extending from ‘modified anytime’ to ‘modified today’. If you are looking for a document which you know was last modified within the last few days, you can zero in on it this way. Users have more control and can find what they need, removing the distraction and drain on time that search commonly involves. Ultimately, users can better concentrate on the task at hand. Another new feature is the ability to refine search results. Previously, when a user ran a SharePoint query from within harmon.ie they would get results from every site collection and site within SharePoint. If they were looking for a project document and could only remember part of its name, for example, the SharePoint search would naturally return all content that included the search term. With so many results, you remain no closer to finding the project document. With harmon.ie 6.8, we’re adding the ability to filter this list to narrow down search without additional keywords. You can right click on the column header to filter results, making it much easier to zero in on the document you’re trying to find. Improved SharePoint Search means you can find the content you need, even if you aren’t aware of all the document’s metadata. In the modern workplace, digital technology causes several challenges for knowledge workers. While so-called ‘productivity apps’ are introduced to boost productivity, instead these apps often have the opposite effect. This is because many knowledge workers find themselves overwhelmed by the sheer number of different apps they must use. This makes it difficult to locate the information and documents they need, because they don’t know where that information is stored. What’s more, Office 365 users spend most of their day in Outlook. It’s inefficient for these workers to constantly switch back and forth between Outlook and other apps to find information. Not only is this highly distracting, but employees are wasting valuable time searching for content when they could be using that time on more meaningful work. At harmon.ie we are committed to helping people focus on what’s really important in their working day. harmon.ie 6.8 is the next step in this pursuit because it helps knowledge workers find content and focus on their work through enhanced SharePoint views. By empowering users to organize and find their information when they need it, we can help them boost productivity, stay more engaged and make more of their Microsoft investment. 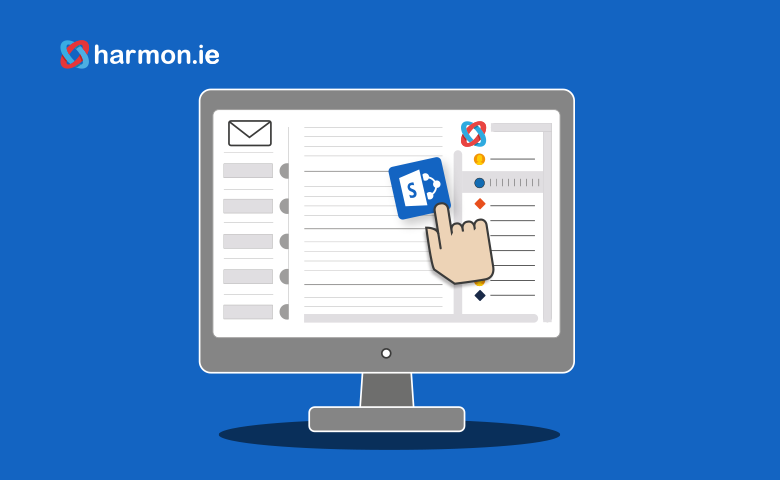 Contact us to learn more about harmon.ie 6.8 and how these updates improve SharePoint search and boost productivity for knowledge workers. Already a harmon.ie customer? Download harmon.ie version 6.8 here!